If you were to look at most of the articles previewing Virginia Tech's 2011 football season you would think the major factors for how the football team will perform are Logan Thomas' shoe size, arm strength, size, or how he's a lot like Cam Newton. Logan Thomas makes for the most entertaining story, as ESPN has declared this to be the year of the QB, and I think he will perform really well, but I feel that the real narrative of the football season is being over looked. Before we know where we are going we need to look at where we have been, and last year at this time a lot of us were thinking national championship. The story coming into 2010 was that our offense led by senior QB Tyrod Taylor and a stable of talented backs would be able to match a Bud Foster defense to lead the Hokies to crystal football contention. There were a lot of high hopes that playing in a high profile game against Boise State would catapult us into the national title picture early and our ACC schedule would keep us there throughout the season. We all know what happened next. The team showed true grit to recover from a bad start to win 11 games in row (beating FSU to win the ACC title) before disappointment in the Orange Bowl against a great Stanford team. One of the only good memories from Orange Bowl. LT has the NFL measurable advantage over Tyrod but one thing you couldn't measure with Tyrod was how much heart he played with. Now that last season is over and we are less than 60 days away from kickoff I think we can take a look back. Before the Orange Bowl I told friends that if the 2010 team won the bowl game they would pass the 2004 team as my favorite VT team. Even with the loss the 2010 team has a special place for me as a high character team with great leaders that had the heart to win after a tough start. I took a look at the statistics to try to see what picture the numbers painted and came up with a narrative that sums it up. In 2010, the VT football team was able to win 11 games with Tech's best offense of the ACC era and also an amazing ball-hawking secondary, but the team was limited by their worst run defense in recent history which gave up big plays leading to the three loses. Most of the preseason magazines have the offense, specifically the quarterback spot, as the primary focus of how VT will do, but I don't believe that is the true tell on how the season will go. The most discussed story for the upcoming season is if new QB Logan Thomas can lead VT to the national title, like how Cam Newton lead Auburn to the national title. LT has been getting tons of praise, and a lot of it is deserved from his spring performance, but there has been a ridiculous amount of fan and press hype over someone that has taken only 1 meaningful snap within even well-respected football magazines. Phil Steele, ranked VT the highest of all the preseason magazine polls at #5, mentioned Thomas' Heisman possibilities (9th), and picked VT as his 2011 surprise team. LT looked great in the spring game but this is a once again a first year starting quarterback. The Cam Newton comparisons are low hanging fruit as far as physical characteristics and being a first time starting QB go. To really take a look at possible comparisons you first have to look at Newton's numbers and contrast with our offense last year looking at Tyrod Taylor's numbers. From the numbers we can see that Newton only passed for 8 more yards a game than Tyrod did, but Newton was highly efficient. He has 35 fewer attempts, but ranking second in passing efficiency. Tyrod was elite as well ranking thirteenth. Besides completion percentage Tyrod and Newton had comparable seasons from a passing point of view. If LT was to approach Newton's passing numbers the improvement from last year in the passing game production would be marginal which is a testament to Tyrod. With the differences between the Auburn spread and our pro-style offense we can't reasonably expect LT to produce 105 yards running a game as Newton did. He might not even match the more elusive Tyrod Taylor's 47 ypg, but I project we could see similarities to another pass first athletic QB in Marcus Vick who had 29.23 ypg on the ground. To put the expectations of the season's offense in context, last year VT enjoyed its 7th best offense of the Frank Beamer era, and its best offense of the ACC era. The Hokies were ranked 41st overall, which is better than the offensive rank of Alabama during their 2009 national title run. Our 2010 passing offense rank was 72nd which is tied for the best passing offense rank for VT since a young signal caller named Mike Vick took the 72nd ranked passing offense to the national title game. Auburn rode the 66th best passing offense to a national title, which isn't bad considering the average passing offense rank for past 7 national champions is 51. VT's passing efficiency was 19th due to Tyrod throwing 2nd least amount of interceptions in the nation, only beat out by option running Army. A look at the offense in the ACC era. Offense was atrocious 2006-2008 but I think VT is on the positive path of improvement. Judging from history, our style of offense, and reasonable expectations for a first year QB it would be hard to expect LT to improve on Tyrod's passing and rushing numbers. Therefore, he won't be the key reason that propels VT to a better season from last year, a year in which we had a really good offense. For an offense that was 16th in the nation in carries, 90th in passing attempts, and ran 62% of the time I could see consistent line play and David Wilson's maturation effecting the offense more than could be reasonably expected of LT. For the defense though, we can see that 2010 left a lot to be desired. How bad was the defense last year? The symbol of the defense has been the lunch pail. It's a blue collar, tough attitude. In 2010 the run defense got it's lunch ate by quite a few runners. If you stated that last year Virginia Tech had its worst defense of this century that would be accurate. They were ranked 52nd in the total defense which is slightly worse than the 51st defense VT had last time it failed to win 10 games in 2003. One thing that the defense did extremely well in 2010 was intercept the ball. VT was tied for second best nationaly in picks which helped them to be number one in the nation in turnover margin. Looking back over the 2010 games, VT was on the ropes in several games with opponents seemingly able to run at will until the defense made a crucial INT. Remember Boston College with Jayron in the endzone or Georgia Tech with Davon Morgan making the huge momentum turning interception right before half. Anther area the defense did well in was opponent red zone conversions. They only allowed opponents to convert 75.61% of their redzone attempts (24th), but that stat could also be traced back to the clutch interceptions made in 2010. Digging deeper we can see that the passing defense did relatively well when considering pass efficiency defense statistic (19th) and the main problem was the run defense. Last year the run defense was bad--64th best in the nation. Particularly, giving up the big run hurt the defense last year, and one could point to the fact that the defense allowed a run over 40 yards in 7 games. A key thing to take account is that the front-seven was very inexperienced. From 2009 to 2010 the defense lost 4/5 of its best defensive linemen (3 starters and top rotation DT), 2/3 of starting LBs (including losing an All-American in Cody Grimm), and it took another blow during losing starter Kwamaine Battle at defensive tackle during the JMU game. I believe that the key to how VT fares in the 2011 season will be if the defense, specifically the front-seven, can return to being a top 25 defense and are able to stop the run. Consider these statistics, the last 7 national champions averaged being ranked 16th in rushing offense, 11th in rushing defense, and 51st in passing offense. The old football adage of being able to run the ball and stop the run leading to a championship holds up. There is a lot of hope for the defense to return to form in 2011. 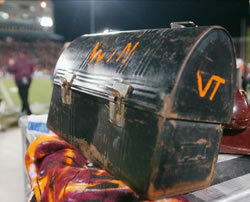 Return of the LunchPail Defense? Last year the defense had struggles against the run, but there are reasons this year will be different. The front-seven this year should be greatly improved because of experience gained last year. All of the players in the defensive front-seven played significant snaps last year even though there are 4 sophomores and 3 juniors projected to start. The Virginia Tech defensive line is flying under the radar, and still has a lot to improve, but I believe they will be up to the task. James Gayle won the Excalibur Award in the offseason this year for his dedication to the weight room. Derrick Hopkins set the sitting front squat records for defensive tackles. In spring practice those two along with JR Collins were singled out for outstanding play. Antoine Hopkins was a starter last year as well and as a junior is the eldest stateman of the starters. I don't have worries about the starting group but there is worry about the backups. Battle is a senior and was a starter last year until facing a season ending injury but the rest of the backups haven't seen any significant playing time. If players such as McCray and Acree don't step up they could see themselves passed by the likes of Corey Marshall and Kris Harley who both already have college size and were rated as 4 stars by Rivals. The linebacker group looks great in terms of both depth and experience. Bruce Taylor has NFL type size already and experienced his first year starting last year. Behind him at the Mike there is great depth with a former starter senior Barquell Rivers and also Jack Tyler who played a lot last year and even started the Orange Bowl game. At backer Tariq Edwards seems to be an improvement over Gibson and might have been the better player even last year as the rush defense had its best game with him playing 35 snaps against FSU. Tariq Edwards received the Richard Bullock Award as the defensive player who showed the most improvement during spring workouts but also might be challenged by Telvion Clark who was a tackling machine in the spring. If the run defense is going to improve Bruce Taylor needs to lead the way. The one spot that received a lot of criticism and will be looked at skeptically this year is Whip linebacker. With the shifting in the coaching staff there is now a coach in Cornell Brown that is primarily focused just on that position, which for a big portion of last year was eliminated by the Nickel defense Bud Foster employed. The two very big differences this year for the Whip spot are there is an incumbent starter in junior Gouveia-Winslow, who had 373 defensive snaps at the position in 2010, and there is real competition at the Whip spot between G-W and the very athletic Alonzo Tweedy who was injured most of last year. G-W came out the spring as the starter but it's looking like Tweedy will receive a lot of playing time as well. If the defense needs any motivation they can look at all of last year and especially how it ended in the Stanford game. The first 4 games of the ACC schedule will provide a test as the defense faces good backs in Andre Ellington, Lamar Miller, Josh Harris (don't laugh he had 241 yards against VT last year), and Montel Harris. Clemson is moving towards pass happy spread offense, but Miami with a mammoth offensive line and Lamar Miller impressing in the spring should be the team to really test the defensive front. Lamar Miller had 163 rush yards on only 15 carries last year and we will really know how much the defensive front has improved on October 8th when da U comes to town. We can't expect a green sophomore quarterback to come in and immediately outdo the best career QB at VT. Maybe a more realistic comparison than Cam Newton is Tee Martin. LT is able to keep the offense going with no real drop-off, managing the stewardship of a run based offense that's able to make the pass plays necessary to keep defenses from loading eight men in the box. Last year most of us assumed the defense would be able to keep its place among the top in the country just based on Bud Foster, but the players play the game and last year's defensive front-seven had a lot less experience and potential than in 2009 and 2011. If VT is successful in 2011 I believe the narrative will be that the team returned to form. A dominant defense with an offense that is able to run the ball effectively and pass well enough to keep defenses honest will be able to get the Hokies a return trip to Charlotte. I like the complete picture set up here. The thing that stands out the most is that Defense (run) wins Championships. Cliche possibly but true. If you can ram the ball down their throats as well as keep them from doing the same you establish two things; T.O.P and off balanced offensive game planning. With our D being ball hawks I'm sure we can control the game as long as the front 7 keep up their end of the bargain. Big plays are bound to happen. It's inevitable, however, 7 games with 40+ yard games is unacceptable. LT is not Cam Newton. He essentially was AU's offense. So I see two things LT needing to do as the leader of our O. One is to implement the K.I.S.S. Method. He has receivers. Damn good ones too. Spread the ball around. I've heard about the chemistry between he and Marcus Davis already but Boykin and Coale are experienced playmakers. As well, we have a big boy at TE who is more than capable of taking medium ranged darts. I don't expect 250 yards a game through the air so if he can convert third downs Mr. Chic-Fil-A and Ogelsby will clean up the rest. I hate hate premature NC banter. As much as LT fits the bill in Cam like stature I see the first four games as the litmus test. Not just by grabbing W's either. We have to do it with authority. Solid game planning both before and through adjustment. Squeaking by leading up to Klempsun will not make anyone's confidence barometer spike on high. We need to dominate early for me to feel comfortable thinking about a NC. Look back at the 1999 season and you will see a team that dominatied early. That was smash-mouth football that needs to return. on the rushing tests being the sleeper benefit to our "easy" OOC games. Gives the D a chance to work on the fundamentals against good live competition without necessarily worrying about a big game, making unneccessary mistakes under pressure, and forming bad habits that might rear up when it really matters. I sincerely hope this will be the first and only time I compare the two before the season begins considering I author the LT3 Hype-O-Meter. Obviously they are similar in size and athletic ability, so I won't be scratching at the surface. In terms of offensive expectations, I think what HokieJoe3 said was valid. It is unreasonable for LT3 to be a better passer than Tyrod in his first year. I'd be happy to be proven wrong. However, I do think we'll use LT3 differently than Tyrod, more like Cam Newton, more QB powers and options, less improvisational runs. It's more than a guess too. How much will we see? I think him carrying the ball will be a part of the gameplan, but not the gameplan early in the season. The coaches will see where it takes us, and adjust accordingly. I like this approach, numerous designed caries in favor of LT3 scrambling around and running the occasional option. His size, speed, and athleticism is too good to waste sitting back in the pocket all day. I agree that we need to get him out of the pocket on designed runs to take full advantage of what LT can bring to the table. But I'm also worried about our QB depth. I figure it's really going to depend on how the backups step up in fall practice as to whether the coaches will feel they can take a lot of risks throwing LT into more contact-drawing situations. We may see that more in 2012 than in 2011. But here's hoping those backups look really good in the fall and make this less of an issue. There's certainly any number of bodies, but with limited experience. I think Leal will end up winning the spot. I'm sure the coaches are worried about it, but I hope it doesn't force them to keep LT3 inside the pocket. Football is football and an injury can happen at any time. He's too good to waste. I agree about Leal. Not only does he look deserving, but that will only help further entrench us in Florida recruiting (Flowers, Hosley, Leal, Lockhart, Blue). As much as injuries can happen at any time, Tyrod proved that they can be managed by physical conditioning and learning how to be smart on the field. He was hurt early and often early in his career, and was tough as a stone late. Judging by reports of Thomas, Exum, and Roberts gaining tons of weight this offseason, it seems that Tech's S&C program can pack on as much protective muscle as one could ever dream.